An immigration protester who climbed the base of the Statue of Liberty on July 4 is taking a jab at first lady Melania Trump at her latest court appearance. Therese Okoumou wore a green dress on Friday painted with the words "I really care, why won't u?" 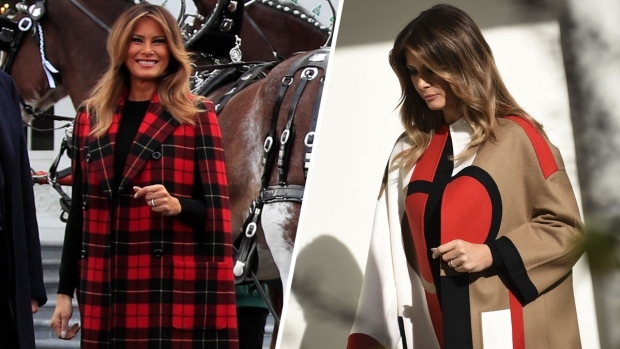 — a reference to the jacket the first lady wore on her way to visit a facility for migrant children in June. Her jacket said: "I really don't care, do u?" The 44-year-old Okoumou has pleaded not guilty to trespassing and disorderly conduct. If convicted, she faces up to six months behind bars per count. Her next court appearance is Oct. 1. Okoumou said she climbed the landmark as a spur-of-the-moment protest against the separation of children from parents crossing the U.S.-Mexico border illegally.